This level has medium difficulty. 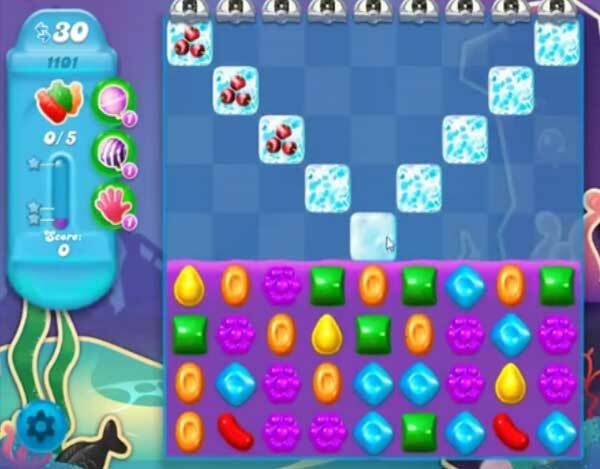 For this level try to play from top part of soda and make special candy as you get the chance. Make special candy and combine them with each other to break the blockers and bottles that are in top part of the board. Level 1101 is not medium difficulty it is now classed as hard. It takes forever to get to the 1st bottle & up till now I can only manage to get to 2 bottles. Video shows 1st bottle free after 2 hits. It takes 4. Still haven’t gotten past 3 bottles. I’ve gotten to three before running out of moves. It takes 4 hits the break blocks. Then another to release soda bottles that’s 4 x 5 = 20 moves. Leaving only 10 to get there. So far impossible!